Sorry about the “cliffhanger” ending on my last post. I will cut right to the chase. Although many of us would quite correctly guess that the problem was related to rod bearings, that was not the case. No, my car chooses to march to the beat of a different drummer. The problem was pretty obvious once I got a chance to look at the engine closely. 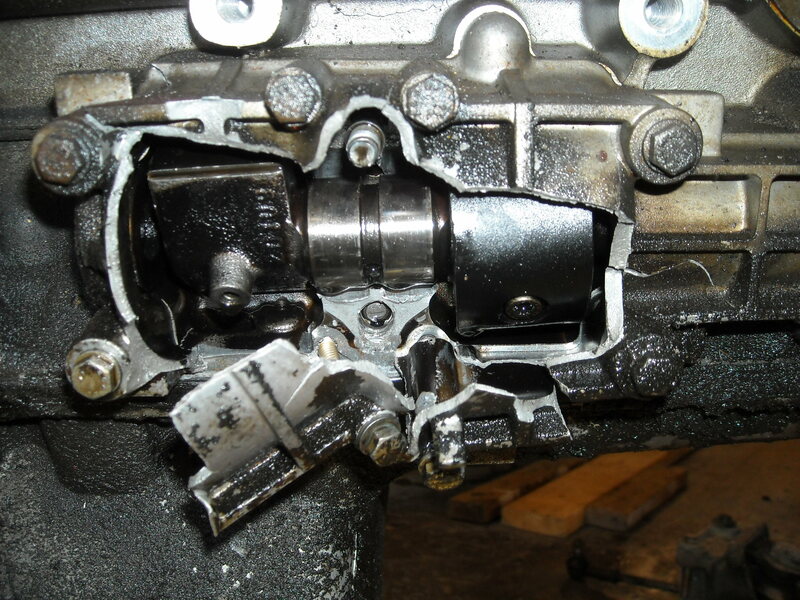 The rear part of the lower balance shaft cover looked like a grenade had gone off inside it. This explained the pieces that the corner worker had brought me. The large quantity of smoke was apparently due to oil inside the cover releasing directly on to the hot exhaust manifold. 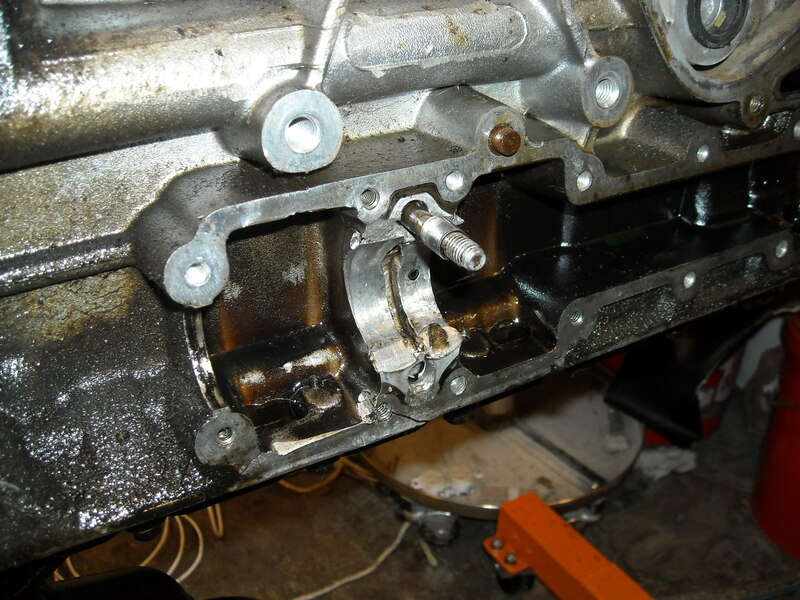 It’s pretty hard to even see the lower balance shaft cover, much less work on it in place. So I decided to pull the engine. Clarks Garage has a very nice tutorial on what is involved with taking out the engine. Obviously, being the first time I had ever taken out a 944 engine, getting the engine out took several days. But eventually I got it out. BTW I lowered the engine out through the bottom of the car, which seemed to work very well for me. Having a mid-rise lift in my garage really helps in this regard. Once I had the engine out of the car, I was able to perform a closer inspection of the damage. Here is what I saw. In the center of the picture is the bearing journal, at the rear of the balance shaft. On either side of the bearing are eccentric balance weights. They are roughly a half moon shape on the balance shaft. I thought about different options. Most reasonable people would have discarded this engine and gotten another used engine from the junkyard. But in effect I had been running with a used engine and look what that got me. So I decided to look into a re-build. Also, I was intrigued with doing the work on the rebuild myself. It looked like I had a good candidate to learn on! Next time I’ll talk about my engine rebuild and, eventually, how a one month rebuild turned into 7 months with the car out of action.